After the historic discovery of C60+ in diffuse clouds, the new hypothesis, top-down chemistry (TDC), is receiving much attention in the field of astrochemistry. Unlike the ordinary bottom-up chemistry (BUC) in dense clouds which produces molecules from atoms and simple molecules by chemical synthesis, TDC produces molecules from dissociation of large molecules and dust in interstellar space. Large molecules and dust produced in circumstellar envelopes of late-type stars are transported to diffuse clouds and become the starting material of chemistry. The discovery of C60+ is a good evidence of the TDC since it is impossible to produce C60+ by BUC in the low density environment of diffuse clouds. Further proof the TDC is anticipated from laboratory experiments and astronomical observations. 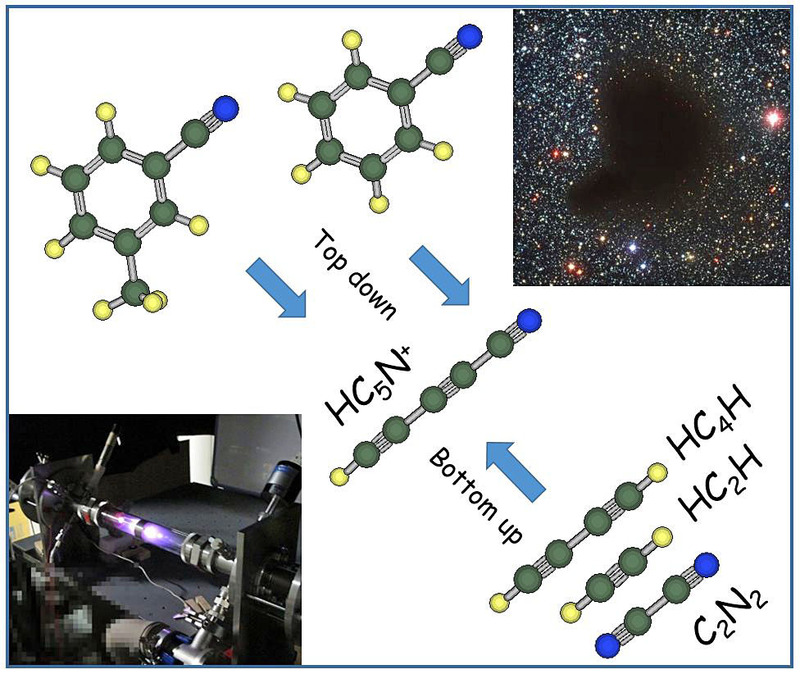 Recently, we observed top-down production of a linear carbon-chain molecule HC5N+ from aromatic benzonitrile in a hollow-cathode discharge in the laboratory as the first detection in discharge plasmas. At the very least, this detection suggests a reaction path from an aromatic to a linear carbon-chain molecule by TDC exists in a gas phase. In addition to laboratory study, I will present our recent results of linear carbon-chain molecules, HC3N, C7H, C6H2, etc., in molecular clouds by radio observations.